*Easy to install and simple to use. Super low power consumption, ecofriendly. *It&apos;s conveniently to let the light or exhaust fan auto on/off. Adjust the light soft and stable, no flickering. 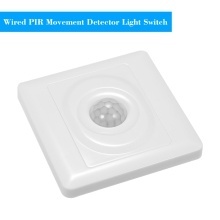 *The switch can detect human body&apos;s infrared, and use infrared to control the load. *You can install the human body sensor in the appropriate environment according to actual needs. *Applications: Incandescent lamp, energy-saving lamps, LED lamp, fluorescent lamp,exhaust fan and other kinds of loads.